Liberal was 23-2 and 17-5 in each of the past two seasons. So they have been 5-0 for three straight years. But this year’s team has already gone over that plateau. 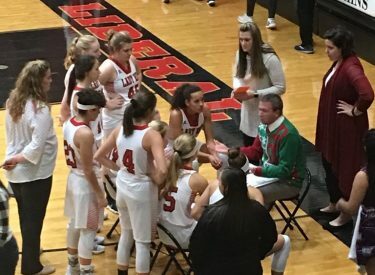 With a 59-38 win over the Perryton Rangerettes Friday night in the Big House, LHS is 6-0 for the first time since 2009. Liberal struggled again in the first quarter as Perryton jumped to a 14-9 lead. The Lady Redskins took a 27-19 lead at the half. Liberal led 40-22 at the end of three and built a fourth quarter lead of 53-29. Katie Horyna poured in 20 points. This is her third straight game scoring 20 or more and she scores 20 or more for the fourth time this season. Machia Mullens added 16. Aubrey Warden scored a career high 11. Liberal was 13-18 at the foul line while Perryton was 9-12. Liberal maded 4-11 three pointers and PHS was 5-14. Liberal is 6-0 for the first time since 2009 when they started 9-0. Perryton is 8-8. Liberal hosts Hays January 4 at 6 with Redskin Pre-game at 5:45 on 1270 and kscbnews.net.